It's not always easy to separate the energy used to heat your home from that used to power lights and appliances, heat water, and charge electronics. For example, there are two different electricity rates (or tiers) charged by your utility. After consuming a certain amount of energy each month, you start being charged at a higher rate. Both B.C. Hydro and FortisBC also charge a fixed amount on each bill, in addition to charging for the energy you consume. You can see how it might be difficult to understand the costs and benefits of different heating options. What's the real cost of heating your home with natural gas or electricity? In British Columbia, there has been much public discussion lately on the relative affordability of these two energy sources. 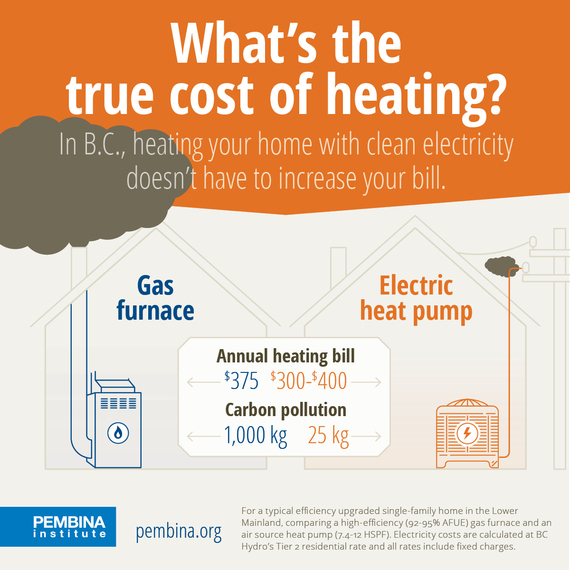 We ran the numbers for a fairly efficient home in the Lower Mainland, and found that gas heating and electric heating can come with similar costs. For the purpose of illustration, let's assume that all the energy used to heat your home is charged at the higher tier. Due to recent increases in the cost of hydro, combined with the continued low cost of natural gas, the cost of electricity at this rate is about four times that of gas (per unit of energy delivered). 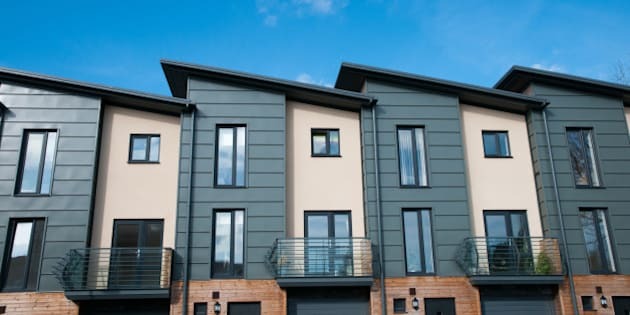 From this, you might conclude that electric heating must be more expensive, but this is not necessarily the case due to a very important piece of technology: the electric air-source heat pump. A heat pump costs a little more than a gas furnace (around $8,000 vs. $5,000, after rebates), but it is vastly more energy-efficient. In fact, while a gas furnace is always less than 100% efficient (newer models are usually 92-95%), a heat pump can achieve efficiencies of 300-400% (i.e. 1 unit of energy in = 3-4 units of heating out). This is the key to affordable heating with electricity. Most heat pumps also offer the extra advantage of providing cooling during the summer. Comparisons of natural gas and electric heating often only consider baseboard heaters, which are very inexpensive to install but use more electricity than heat pumps (and therefore can be expensive to run). Determining when a heat pump costs less to run than a gas furnace depends on a lot of factors. The size of your home makes a difference, as does how well insulated and sealed it is. If you live in a large, old home, it might still be more expensive to use a heat pump. However, if your house is smaller, or has had its insulation or windows upgraded, the economics start to come out in favour of a heat pump. Therefore, making sure all British Columbians have access to low-cost energy-efficiency upgrades needs to be a priority. For most homes, the costs are comparable and both a gas furnace and heat pump are far cheaper than using baseboard heaters. However, if you live in an extremely efficient home or apartment (such as a Passive House), your demand for heat can be so low that baseboard heaters become the most affordable choice, because they are so cheap to install. Until rebate programs for heat pumps improve, it will still take a number of years for the energy savings of a heat pump to pay for the added installation cost, but that is only true as long as natural gas prices remain low. The commodity price of gas is set by global markets and unexpected increases are largely out of British Columbians' control. The federal government's plans for an increasing carbon pollution price will also increase the relative cost of gas heating. Heating your home with electricity instead of natural gas reduces carbon and other air pollution. While gas is cleaner burning than heating oil, it is far more polluting (around 17 times more) than our electricity, which comes mostly from hydro. Using electricity instead of gas in our homes and buildings is one of the cheapest ways to reduce pollution. It's also a more sustainable option for the future, because governments at all levels in Canada have committed to reducing the amount of fossil fuels used in buildings by 2030. The take-away? Electric heat pumps offer safe, reliable heating and reduce pollution -- and these benefits don't have to come at the cost of higher utility bills.